Over 150 sizes in stock for immediate delivery. If you are looking for a custom box, Palmer Packaging can design, produce, inventory and ship your product to you in a very timely fashion. Our on-site design department can help you develop new printing on your carton, or help you to redesign an existing box to better protect your product. Honeycomb is made by joining individual bands of kraft paper together into a series of continuous hexagonal cells. In most cases, the cells are faced on both sides with similar materials to create what is, ounce for ounce, the strongest product known. A cookie-cut is made by creating a slit in both of the facing papers and a portion of the core, leaving the panel held together by the uncut center core. Runners and small inner pieces can be created this way, making them easier to handle and allowing them to be separated easily by gently pulling each piece apart as needed. A high tack adhesive is applied to one side of a honeycomb panel and covered with a release paper. The paper is removed by the end-user, who can then apply to a surface. 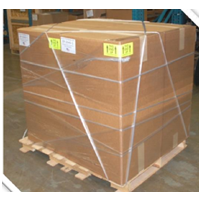 The panel is typically used as a block support in pallets or inner packaging. 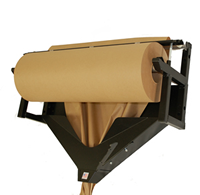 Call our sales department at (630) 628-6500 for more information about the corrugated Honeycomb products. Start out with basic stretch-film 2. Switch to the roper in one, easy step 3. 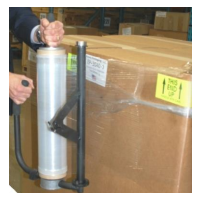 Wrap loads and secure to the pallet with one easy, affordable tool. 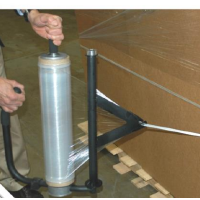 Copyright © 2018 Palmer Packaging, Inc.